September has been unseasonably wet and windy in the NW Highlands, making wildlife watching a little more challenging. Nevertheless, we have had a couple of successful wildlife weeks at Glenloy, with lots of great sightings, with more between the set holidays. Autumn is now upon us with the bracken having turned and the leaves on our trees starting to flutter down in the wind. It promises to be a good year for autumn colours with the cherries and rowan glowing red, whilst the oak leaves are starting to turn orange and yellow. Even more spectacularly, we have had a period of the most vivid rainbows, including a complete double with reflections in Loch Linnhe. Waterfalls have been gushing from recent rain and the tops of the Nevis rain are now dusted in snow. The first skeins of pink-footed geese have been yipping, unseen, above us. Flocks of mistle and song thrushes have been gorging on the remaining rowan berries, no doubt before their Scandinavian cousins arrive. Great northern divers have started to reappear off the coast, some still in breeding plumage, while Slavonian grebes are gathering in small numbers, again in all phases of plumage transition. Pine martens and squirrels have grown their winter coats and are sporting luxurious, bushy tails. 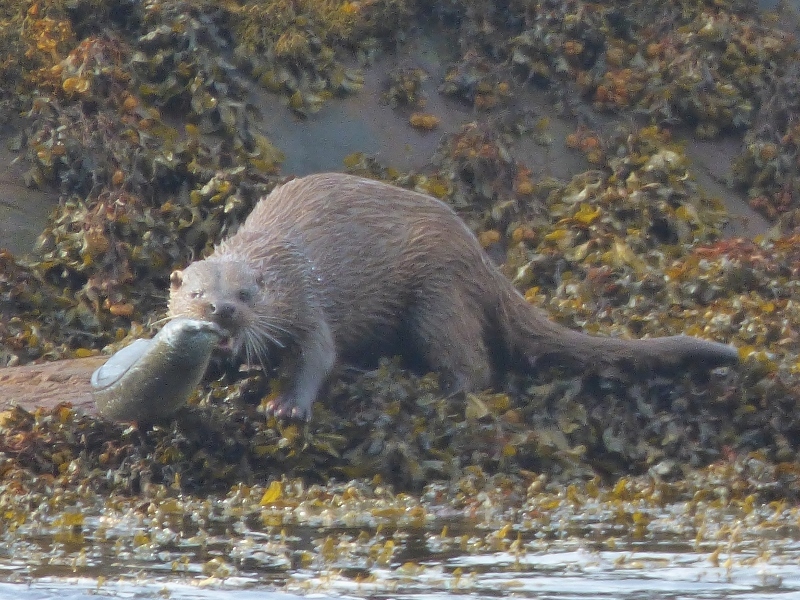 Otters have started to appear with increasing frequency, and we have had lots of sightings over the past few weeks, some in places such as Rhu, where we have not seen any since early spring. By far the most dramatic sighting was that of a large dog that had just caught a large conger eel, approximately twice its own length. It managed to haul this ashore and proceeded to dispatch it, eating it from the head backwards. A rival or hopeful mate appeared on the rocks beside it, but did not get a look in, and soon disappeared to do its own hunting. Periodically the first otter would swim around the rocks (some 15-20m offshore) with its prize, before clambering back onto rocks to eat some more. 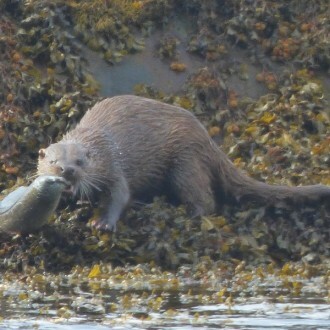 This went on for around 30 minutes until the last of the conger was finally consumed, at which point the otter vanished. As we walked back towards the minibus, we came across a very fresh pile of otter spraint on top of the sea wall, so probably missed its farewell gesture to us. Eagles have also been readily viewed, particularly golden eagles. Excellent views of a close pair were had in one of our favourite territories, and yesterday we had three different sightings, each in a different location. One of these appeared the same time as an adult white-tailed eagle, which remained to hunt over the near hillside. As it did so it was continuously mobbed by a buzzard, which it had to fend off by rolling onto its back and flashing its talons. Sea eagles have also started to be seen with increasing frequency perching on the monument at the point of the River Gour. At a distance these huge birds break up the outline of the ball capping the plinth and can be seen with the naked eye. We have also had plenty of other raptor sightings, including hen harriers around the coast, kite around Loch Ness and the occasional flash of a merlin. The number of visible kestrels has swelled, as it often does at this time of year, whilst sparrowhawk and buzzard are ubiquitous. Barn owl have been spotted along the Banavie road and tawny owls are calling around Glenloy Lodge. Red deer are becoming more obvious, particularly in the late afternoon, with groups of hinds gathering close to the road in places. 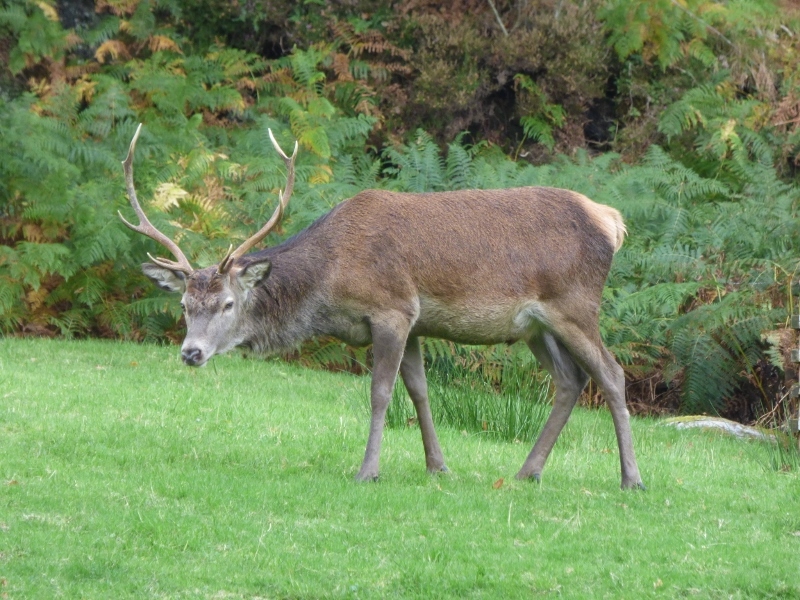 The onset of the rut seems to be late this year, and we have yet to hear any stags bellowing. Indeed, groups of stags chumming each other can still be found, including a group of magnificent beasts casually grazing on an estate lawn. However, we have spotted at least one group of hinds accompanied by a solitary stag, so things may be hotting up Possibly the lack of grass in the spring has delayed things slightly. 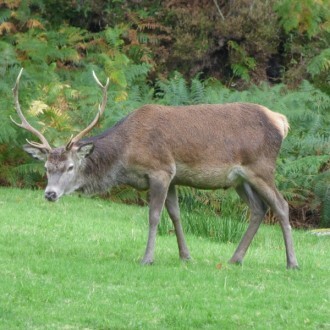 Conversely, we saw a group of sika hinds with their stag in tow in early September, the females mostly still in their spotted summer coats. Roe deer have finished their mating period and again are becoming more visible in the fields by the canal. Up on Cairngorm a herd of reindeer crossed the hill towards us and led us up to the ski resort, providing ample photo opportunities. Cetaceans have been a bit more tricky as the weather turned wet and windy. Despite good sea conditions we only managed to find porpoise on a trip out to Muck. 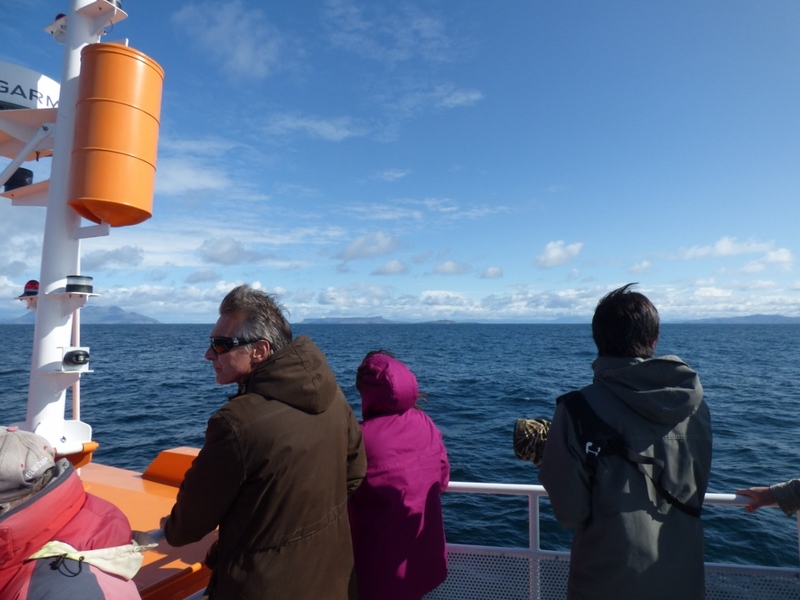 A full day’s whale watching from Tobermory out to the Cairns of Coll produced a single minke whale, and that rather briefly, together with a couple more porpoise. The scenery around us was stunning, however, and we were accompanied for large parts of the journey by two great skuas hovering just behind the boat, whilst storm petrels flitted alongside, shearwaters swooped over the waves, and gannets plunged nearby. 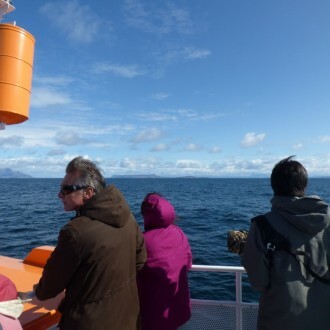 As a windy alternative to whale watching we took the scenic trip to Knoydart, returning via Loch Nevis this week. The sheltered water made for excellent cruising, with further porpoise, and the bonus of a nearby goldie. Insects, not surprisingly, have been in short supply. However, we have had red admirals and peacocks in the garden plus a couple of unexpected painted ladies this month. Southern and common hawkers still patrol the forest rides, whilst darters bask in bursts of sun between the showers. Autumn moths grace the trap, but only after cloud has kept the temperatures up at night. Whilst sadly recognising their inevitable loss this year we look forward to the deer rut proper and the return of migrant ducks, swans, geese and thrushes. << High Summer – or early Autumn? High Summer – or early Autumn?